Not to be confused with Bindusara. Bimbisāra (c. 558 – c. 491 BC or during the late 5th century BC) also known as Seniya or Shrenika in the Jain histories was a King of Magadha (r. 543 – 492 BC or c. 400 BC) and belonged to the Haryanka dynasty. He was the son of Bhattiya. His expansion of the kingdom, especially his annexation of the kingdom of Anga to the east, is considered to have laid the foundations for the later expansion of the Maurya Empire. He is also known for his cultural achievements and was a great friend and protector of the Buddha. 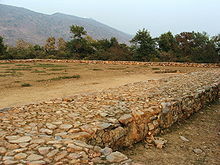 Bimbisara—according to Hiuen Tsang—built the city of Rajgir (Rajagriha), famous in Buddhist writings (others attribute the city's foundation to his successor). He was succeeded on the throne by his son Ajatashatru. Bimbisara was the son of Bhattiya, a chieftain. He ascended to throne at the age of 15 in 543 BC. He established the Haryanka dynasty laid the foundations of Magadha by fortification of a village, which later became the city of Pataliputra. Bimbisara's first capital was at Girivraja (identified with Rajagriha). He led a military campaign against Anga, perhaps to avenge his father's earlier defeat at the hands of its king, Brahmadatta. The campaign was successful, Anga was annexed, and prince Kunika (Ajatashatru) was appointed governor at Champa. Bimbisara sent Jivaka, his physician, to Ujjain for medical treatment of Pradyota, the king of Avanti, from jaundice. Pukkusati, the king of Gandhara, sent Bimbisara an embassy. Bimbisara used marriage alliances to strengthen his position. His first wife was Kosala Devi, the daughter of Mahā Kosala the king of Kosala, and a sister of Prasenjit. His bride brought him Kashi, which was then a mere village, as dowry. This marriage also ended the hostility between Magadha and Kosala and gave him a free hand in dealing with the other states. His second wife, Chellana, was a Lichchhavi princess from Vaishali and daughter of King Chetaka. His third wife, Kshema, was a daughter of the chief of the Madra clan of Punjab. Mahavagga depict him of having 500 wives. According to the tradition, Bimbisara was imprisoned by his son Ajatashatru to ascend the throne of the kingdom of Magadha. Ajatashatru later ordered his father's release after the birth of his first child, but by then it was too late and Bimbisara had already died. This was reported to have taken place around 491 BC. 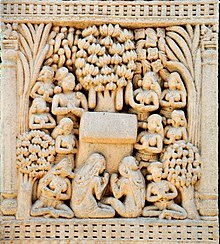 Bimbisara is referred to as Shrenika of Rajgir in Jain literature who became a devotee of Jainism impressed by the calmness of Yamadhar (a Jain Muni). [better source needed] He frequently visited Samavasarana of Lord Mahavira seeking answers to his queries. He asked about the true version of Ramayana and an illuminating sage (King Prasana). He is said to be a Balabhadra in one of his previous lives. Per Jain scripture, Bimbisara killed himself in a fit of passion, after his son had imprisoned him. Consequently, he was reborn in hell, where he is currently residing, until the karma which led to his birth there comes to an end. It is further written, that he will be reborn as Mahapadma (sometimes called Padmanabha), the first in the chain of future tirthankaras who are to rise at the beginning of the upward motion (Utsarpini) of the next era of time. According to Buddhist scriptures, King Bimbisara met the Buddha for the first time prior to the Buddha's enlightenment, and later became an important disciple that featured prominently in certain Buddhist suttas. He is recorded to have attained sotapannahood, a degree of enlightenment in Buddhist teachings. Although Bimbisara let the women in his palace visit Buddha in his monastery in the evenings; the women wanted a hair-and-nail stupa they could use to venerate the Buddha any time. Bimbisara spoke with Buddha who complied with their request. According to Puranas, Bimbisara ruled Magadha for a period of 28 or 38 years. Sinhalese chronicles date his reign to be of 52 years. ^ Hugh George Rawlinson (1950), A Concise History of the Indian People. Oxford University Press, p. 46. ^ F. Max Muller (2001): The Dhammapada And Sutta-nipata. Routledge (UK), p. xlvii. ISBN 0-7007-1548-7. ^ Keay, John: India: A History. 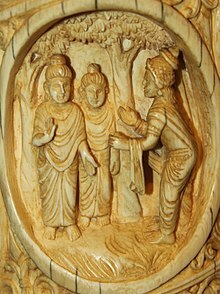 Revised and Updated: "The date [of Buddha's meeting with Bimbisara] (given the Buddhist 'short chronology') must have been around 400 BC." ^ von Glasenapp 1999, p. 40-41. ^ a b Jain & Upadhye 2000, p. 59. ^ a b V. K. Agnihotri (ed. ), Indian History. Allied Publishers, New Delhi 262010, p. 166 f.
^ Peter N. Stearns (2001), The Encyclopedia of World History. Houghton Mifflin, p. 76 ff. ISBN 0-395-65237-5. ^ Raychaudhuri 1923, p. 97. ^ a b "Bimbisara". Encyclopædia Britannica Online. Retrieved 25 January 2013. ^ a b c Sen 1999, p. 112. ^ Upinder Singh 2016, p. 269. ^ Kailash Chand Jain 1972, p. 99. ^ Jaini 1998, p. 228. ^ Dundas 2002, p. 41. ^ Dundas 2002, p. 40-41. ^ Kailash Chand Jain 1991, p. 88. This page was last edited on 12 December 2018, at 14:44 (UTC).